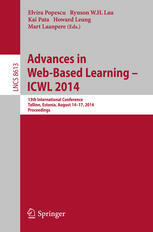 ICWL is an annual international conference on web-based learning organised by Hong Kong Web Society. The first ICWL was held in Hong Kong in 2002. Since then, it has been held in Australia (2003), China (2004), Hong Kong (2005), Malaysia (2006), United Kingdom (2007), China (2008), Germany (2009), China (2010), Hong Kong (2011), Romania (2012) and Taiwan (2013). ICWL 2014 will be the 13th ICWL conference and will be held in Tallinn, Estonia. The conference program will feature keynote addresses, workshops, panels, posters, demos and industry track, in addition to presentations of refereed papers that have been selected by the international program committee.